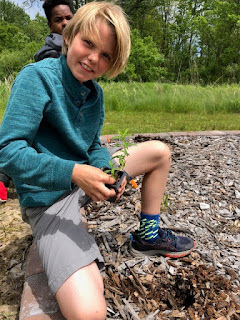 An outdoor learning project led by Rebecca Linstrom and supported by a variety of outdoor enthusiasts who realize that learning is more than a classroom endeavor. 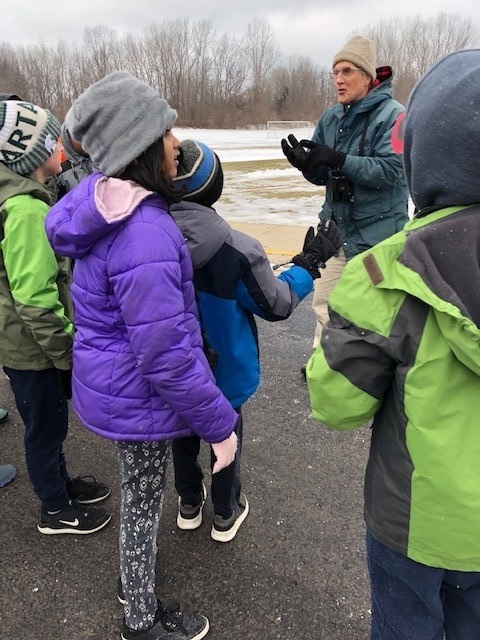 This past February my class, with the help of Russ Schipper, participated in the Great Backyard Bird Count through Cornell University. Russ has been coming in to lead this adventure for the past several years. This year was especially cold and windy. The smaller winter birds that frequent our bird feeders were all undercover keeping warm. It was bitter cold but we did see a red-tailed hawk, several mourning doves, a seagull and some American crows. 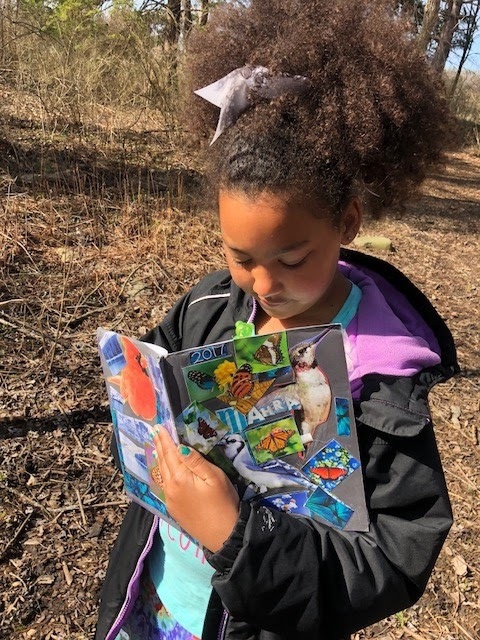 We recorded our findings (along with thousands of other citizen scientists) on the Cornell Ornithology website. We watched in real time as results came in from all over the world. We cheered when a spot that looked like South Haven lit up on the map. Our finds were submitted! Thank you Russ! This year, after our outdoor adventure, we had another guest, Bob Linderman came in and shared the trip he took with National Geographic to Antarctica. He brought in a video of his adventure and told stories of this amazing place. It was fun to see the penguins and other sea creatures (they would have been at home with our cold temperatures that day). Thank you Bob! Bob is a retired teacher. I worked with Bob a couple of years and he was generous to my students and myself. He kept an eye out on our bird feeders and at random times he would stop into our classroom and in a gruff voice say, "Mrs. Linstrom, it looks like you need to fill those bird feeders! Do you think you can spare a couple of students to help me fill them for you?" This was always a welcomed interruption and a couple of lucky students would go out with Mr. Linderman and fill the feeders. Bob is also known for his dedication to Cub Scouts and Boy Scouts. Although I don't know him well, he is well loved by many, many students in our district. This past Saturday, I had the wonderful pleasure of sitting down with a friend. She has worked as a substitute teacher for many years in the South Haven Schools. She was my long-term sub when I needed that support. She is not subbing this year, as she is struggling with a cancer diagnosis and is too weak to work. On Friday, at the very end of the day, the students and I were sharing our weekend plans. I told them that I was going to visit Mrs. Gruber. All of my students started buzzing . . . "I haven't seen her in a long time . . . Where is she? I miss her . . . She was so nice. . . " I shared with them that she was too sick to sub and that she was dealing with lung cancer. There was a collective sigh and one student piped up, "My mom had cancer five years ago and she's doing great!" My students asked that I say hello to her from them. They all know her from various days that she had stepped into their classrooms and they remembered her for her fairness, kindness and ability to be stern without being mean. Thank you Patty! Here is what I know . . . teaching is much more than what we say. "We teach who we are." Students need adults like Russ, Bob and Patty who teach them that they are genuinely cared about and respected as individuals. They are not there to grade them, they are there to share their knowledge with them and to care for them. Teaching is relational. And I am forever grateful for their gifts to my students. They are given much more than a lesson on birds or Antarctica or some generalized sub plans when they are with Russ, Bob or Patty . . . they are learning that they are important and that they are worthy and that they are loved. This is what matters and what is transformative in the lives of others. Thank you Russ, Bob and Patty! Gratitude and Lessons Learned . . . 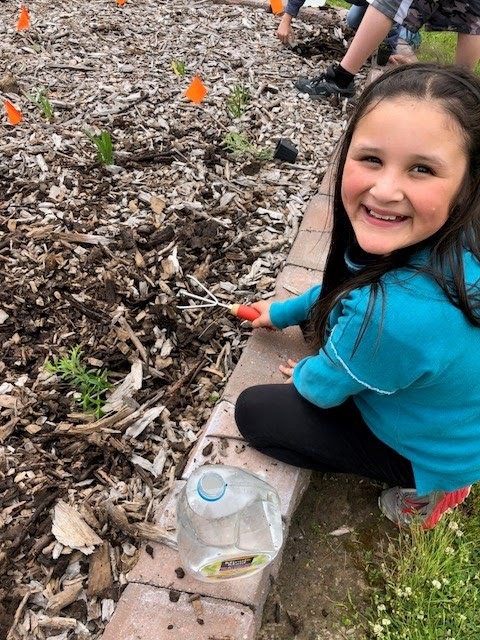 The Outdoor Learning Center at North Shore Elementary School continues thanks to the many individuals that support this project. 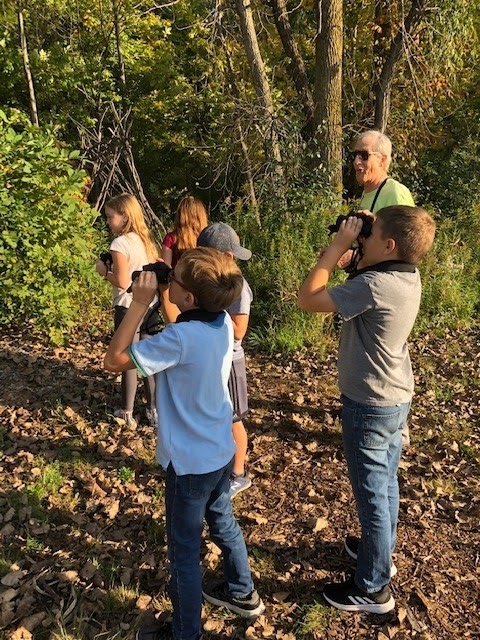 The South Haven Garden Club gave us a grant this fall to purchase seven very nice binoculars for our birding expeditions. 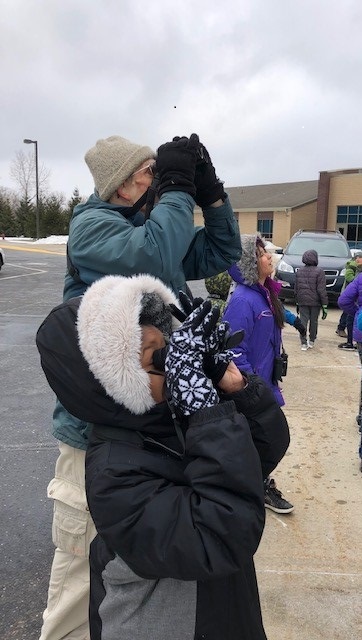 Russ Schipper has continued to support this project by being our resident expert in all things birds and nature (my students are looking forward to the Backyard Bird Count (through Cornell University) with Russ this February). His wife, Ilse continues to be our monarch butterfly expert and donator of milkweed for our new butterfly garden. I am most grateful for this ongoing support. 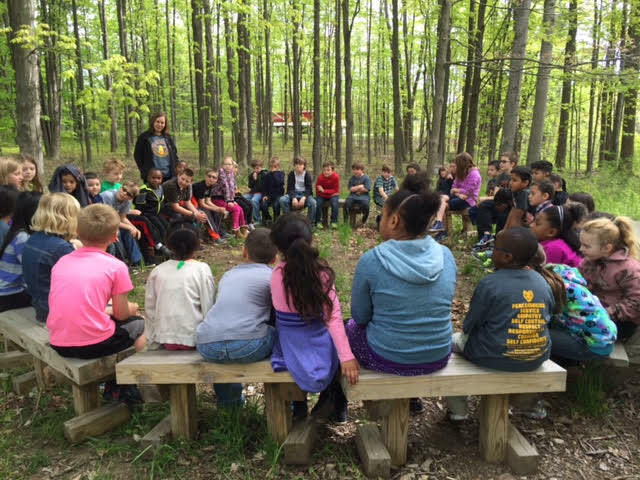 I can't imagine my life as an educator without the amazing people who support this outdoor learning adventure. Although many individuals have supported this project over the years (too many to mention here although if you read through the many previous entries it is a long list of generous folks) I have yet to get the full support of South Haven Public Schools. This may seem odd, because the one group that you would think would be most supportive of this project (if only because they are most directly benefiting), South Haven Public Schools, has not donated or helped in any way (besides giving the initial school board okay several years ago). In fact, the head of maintenance has reminded me several times (usually while I'm out working in the gardens on my own time) how it takes more time to mow around the four trees that we planted (a generous donation from Ann Frost) than if there were no trees. He has also implied on numerous occasions how the project will simply become another mess that he will eventually have to clean up. And, while under his instruction the garden crew mulches the trees around the school, they leave those donated trees for me to mulch. Thankfully, the city donates mulch to me every year and I faithfully mulch the raised beds and the trees. Our new butterfly garden (an Eagle Scout Project) was strategically placed in an unmowed field, which is now not only being mowed around, but the border to the garden is sprayed with Round-Up! I've suggested that they stop mowing the field and to please stop spraying poisons (think of the time and money they could save). I was told that I should put signs out in the garden (preferable in Spanish) that say not to spray. Apparently, the message to not mulch specific trees can be relayed, but to not mow or spray poisons around a Certified Monarch Waystation, is too difficult an instruction for the garden crew to understand. I know this lack of support is not about time or energy, it's about power and making sure that I realize this project is not important. I understand their perspective, but I completely disagree and I will continue with or without this support. It is worth my time because I know it is a gift to the students in my class. I know that it benefits their education. Thankfully, there are many others outside of the school that agree with me and have faithfully and generously supported me. Several years ago, I was telling my mom my frustrations regarding the lack of school support for this project. I told her that I felt like I didn't belong; like I had been working on this project for years and I seemed to be the only one at school that seemed at all interested in it. Although I've shared teaching ideas and encouraged other teachers, even they seem to have no time for it. My mom smiled and said, "They need you and you are exactly where you belong. 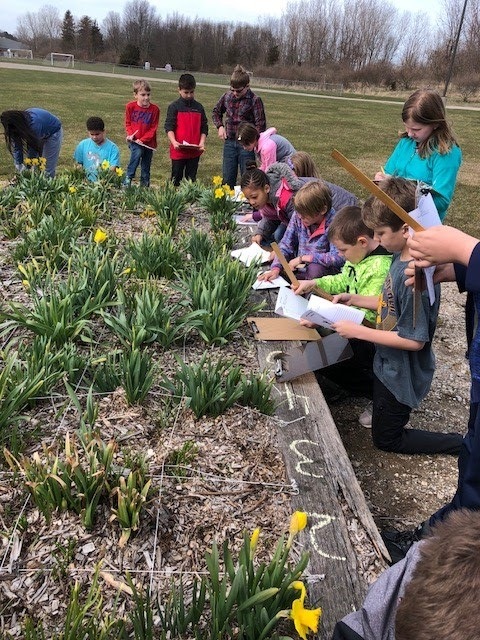 If they had a strong outdoor learning program, they wouldn't need you. You are doing something that you know is good for students and without you, it wouldn't be there. Don't stop because of lack of support from others. Keep doing this for your students and for you." My mom died a few weeks ago, but I can still hear her voice and I'm trying to find her strength. She was a powerhouse. She was famous for standing up for people on the margins in this life and she did so fiercely. I know that there were many times her own feelings were hurt, but what made her special was that she stood up for what she believed even when she felt personally insulted. Even when she felt alone, she found her voice and she stood up. She knew what it was like to be less than popular, but she also knew that being popular was not as important as taking care of her students, or the mentally ill, or the homeless or whatever marginally group needed her help. And she made a difference in this life for many, many people. Yesterday, I was going through my emails deleting the hundreds of pieces of junk mail that come my way. As I was getting to about the end of the summer (I was very behind in my emails) I came across an email that wasn't junk, but that I had failed to read. It was from a former student. At the beginning of the year, I had received a generous gift as a "Favorite Teacher Award" from Meijer (our local supermarket). I had no idea how I had gotten it, but I received a huge donation of arts supplies and a gift certificate to spend on my classroom. I felt unusually lucky that somehow someone must have randomly put my name in a box and I actually won (I am famous for never winning anything). At any rate, I found this old email and the mystery was solved. It was from a student who wrote, "I don't know if you remember me . . . I am in 7th grade now and you are still my favorite teacher and still I love butterflies and still I learn all I can about them. I nominated you for favorite teacher award and they actually picked us for winning . . I just wanted to say thank you for making learning fun and being a nice teacher, and I'm sad you are not my teacher because all the other ones are not like you. . . I got my school supplies paid for me and all I had to do was talk about how nice you were. . . " I immediately responded to him (very late) and thanked him for his kind words. And of course I remembered him! This kind student reminded me why I continue to do what I do. . . And my students continue to teach me each and every day about what is really important in this life and what really matters. Photo from the year this generous student was in my class. 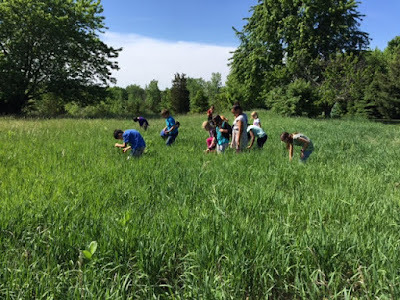 It's a picture of our class and a class of kindergarteners we invited to help plant milkweed in our garden and to teach them what we had learned about butterflies and birds. They brought us a snack to share. A wonderful afternoon was had by all! Thank you to everyone out there that supports outdoor learning and to all those who have supported me over the years. 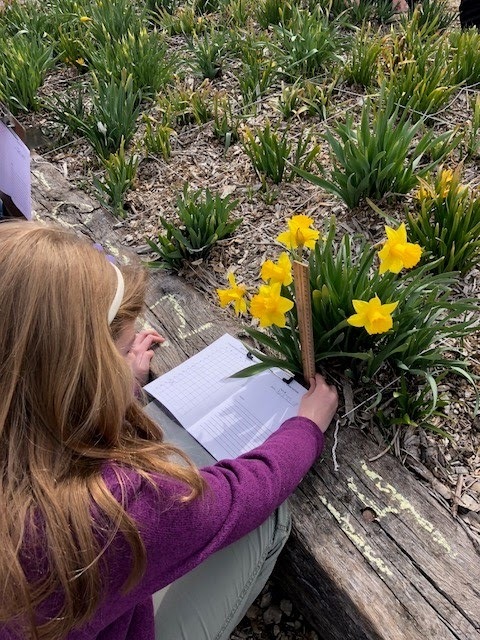 It's a real joy to have an outdoor teaching and learning space for students. This blog has had over 35,000 page views to date and although perhaps most of those views were from folks looking for something else, I hope that maybe it has encourage or inspired a few of you out there that are working in a similar environment. Outdoor learning is a powerful and worthy pursuit. 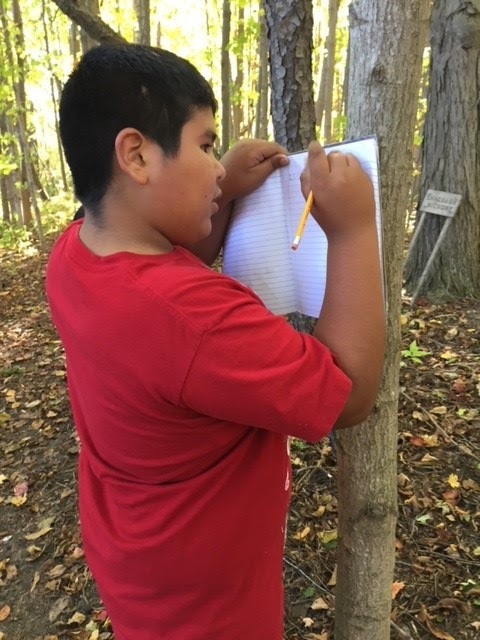 Let's keep bringing students outdoors! Thanks to the generosity of the School Foundation and Garden Club, we have a set of very nice student binoculars to use in our Outdoor Learning Center! Thank you to the many people who support these organizations! You enrich our education on a daily basis! 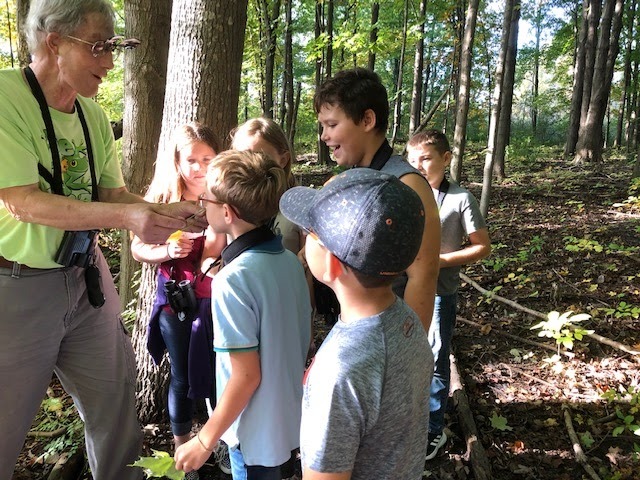 This month, Russ Schipper joined us and we went out in small groups to study nature. 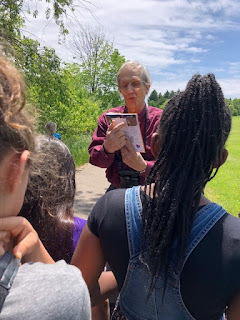 Russ, as many of you know, is a bird expert who comes every year to all twelve of our classrooms at North Shore Elementary and shares his love of birds with our students. The fourth graders get a generalized bird presentation and the fifth graders get a presentation on owls. After two years at North Shore, most every student has had two classes with Russ and knows a bit more about the birds that he/she may hear or see in their own neighborhood. It's an amazing gift of time and joy that Russ has given to us for the past several years. Although Russ is known for his expertise in birding, he also studies nature and specifically the native plants of our area. This is a new passion for Russ as he has lost some of his hearing due to a rare form of cancer. Birding requires a great deal of listening but plants are a bit easier to study and Russ is now sharing his new passion with us! Russ and I took small groups of students out onto the trails with our new binoculars and no agenda but exploration. We had great fun and every group saw or heard different things that we shared with each other after all the groups had been outside. As we discussed what we had discovered, I recorded them on our dry erase board in the front of the classroom and that board was covered although I know we could have added more. . . It is amazing what there is to discover in such a small area of nature. Russ was a wonderful guide. The first thing most groups heard, was chirping. Russ asked us what was making that chirping sound. 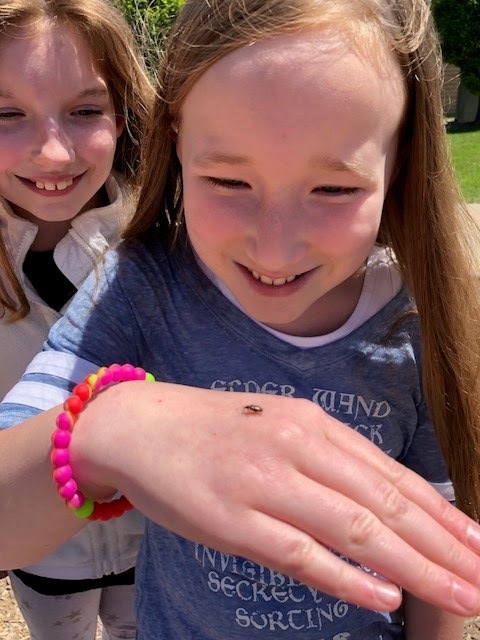 Everyone thought it was a bird but in fact, it was a spring peeper (frog)! Russ told us to look around and see what we can see. We compared leaves and hunted down the trees they fell from. 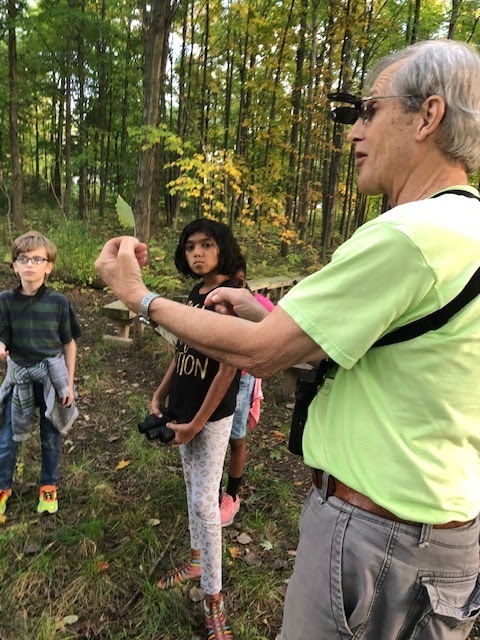 "You'll have to use your binoculars to find the tree that this leaf came from," Russ said as they looked for the leaves in the tree. The excitement was palpable when someone yelled, "I found it, I found the tree!" and we all looked with our binoculars way beyond the other tree branches into the sky at the tulip tree branches and leaves. Another very exciting find was in an old log on the side of the trail. There were two rectangular holes and a student asked Russ, "What are these holes from?" Russ asked them to think what could have made them . . . they guessed termites and several other ideas before one student guessed a bird. Russ said, "You're right! But what kind of bird?" Another student guessed a woodpecker and Russ said, "You're right! But what kind of woodpecker?" And at that point he told us that those holes were made by a pileated woodpecker, the largest woodpecker in Michigan. We were all amazed that a pileated woodpecker had once been pecking away at one of the trees in this woods. There were so many common and yet amazing things we saw on our short expeditions out on the trails that I could go on and on. . . 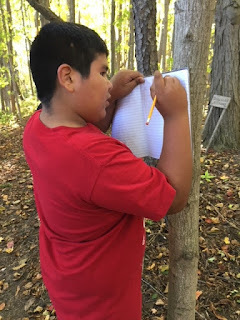 Although we learned a great deal, there was something much more than knowledge we received during our short nature studies. We were reminded how to look and listen and even smell (we found wild onions) with a bit more curiosity. In addition, Russ brought his own joy for exploration and shared it with all of us. What a privilege and joy it was for me to spend time with Russ and the students! "Nature-study is not science. It is not knowledge. It is not facts. It is spirit. It is concerned with the child's outlook on the world." Russ brought the spirit of nature-study to us and I'm so glad to have had the opportunity to see students catching that joy and that spirit! Thanks Russ, from all my students and from me! You have enriched our lives. A new school year has begun! With two weeks under our belts, we are becoming a community of learners. Every day, weather permitting, we run on our lower nature trail loop before starting our formal school day. 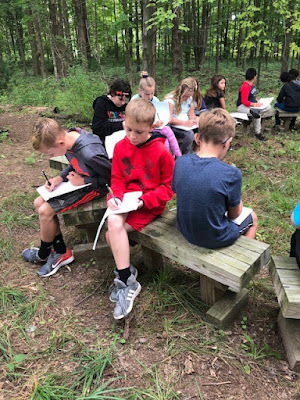 This past week we took a few minutes to be inspired by the woods and write outside in our new writer's notebooks. 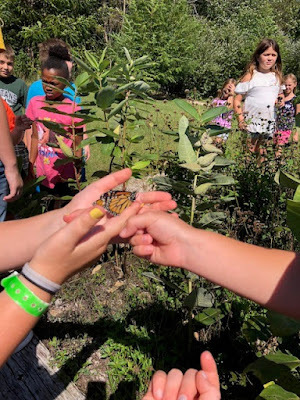 We have also been learning about and releasing monarchs on a regular basis. This coming Monday we have four monarch butterflies to release, four still in chrysalis form and two caterpillars. 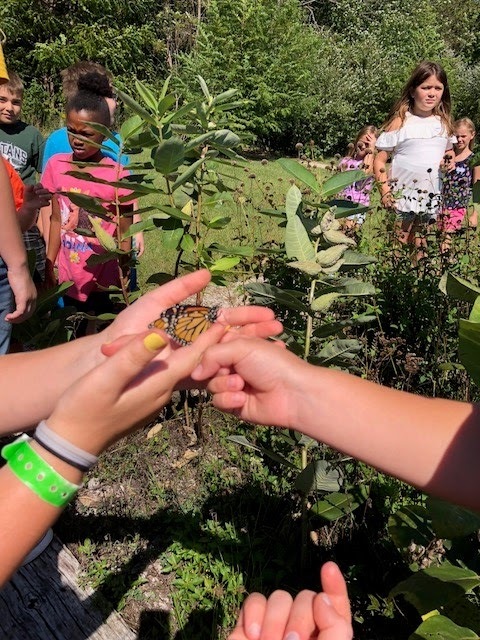 We will learn more about food chains and food webs while studying the milkweed plants in our butterfly garden in the days ahead. We were fortunate to receive a grant from our School Foundation for seven student binoculars and they have arrived! 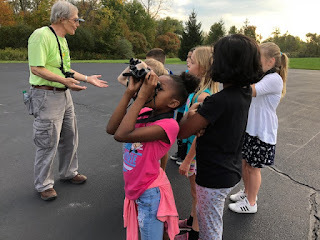 Russ Schipper will be joining us in the days ahead and taking small groups out into the field to learn how to use our new binoculars and how to use field guides to help us identify what we find in our outdoor learning center. I look forward to another great year in forth grade! 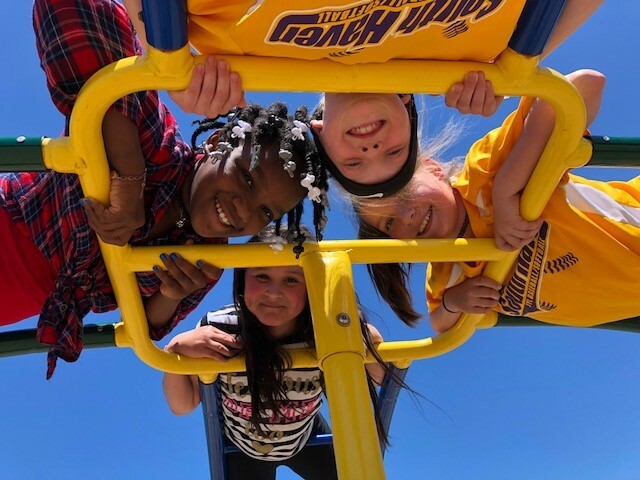 The 2018-2019 school year begins soon! Every August I look forward to meeting my new group of students. It is always exciting and a bit intimidating. Although I've been teaching for over twenty years, each class holds the promise of new adventures and new struggles. 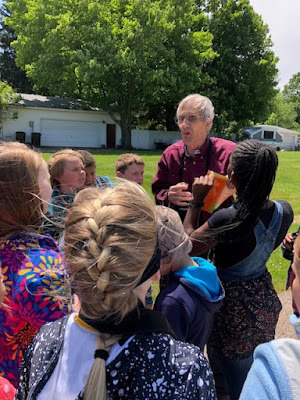 Each year I meet a new group of students with their own unique hopes and dreams for fourth grade. I hope I don't let them down and that I can help them along their educational path. Each year we have new curriculum and new learning targets. All of these unknowns leave me a bit anxious during my last days of summer break. That being said, there are also some deep truths about teaching and learning that don't change much over time. Great thinkers have been sharing their knowledge about learning throughout the ages and they continue to inspire us with their truths. Here are a few that come to mind. . . There are many more quotes like these and they all point to truths about teaching. None of them talk about curriculum, content or delivery. They all point to something bigger and more universal. Teaching is more than what we learned in graduate school or a trick or a performance or a chromebook. It is more than the latest formulated curriculum or set of goals and objectives. Teaching is an art. And like art, it is always unique and takes many forms and shapes based on the students and the teacher and even the moment. Sometimes I fail miserably. Sometimes I'm amazed by what students are able to learn and discover. But always it is a new adventure. In these last days of August, there are many small projects that occupy me. . . setting up my classroom, gathering supplies, reacquainting myself with curriculum and planning the first few weeks of school. 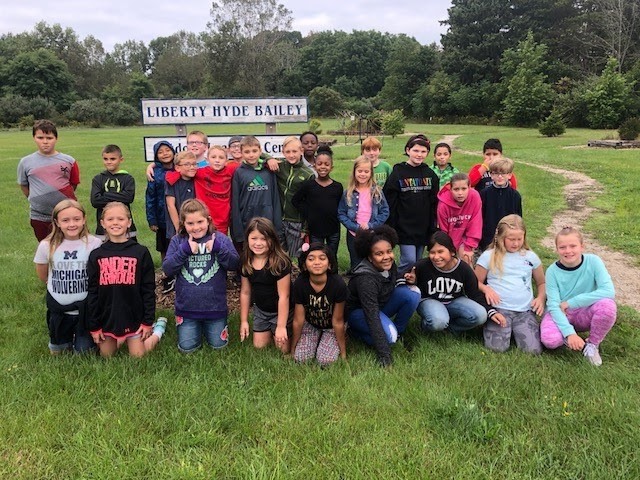 The outdoor learning center needs attention. There are weeds to pull and beds to mulch. In addition, I'm raising about twenty monarchs (I will bring to school) that all need fresh milkweed on a daily basis. And Harold, our class pet, needs to readjust and return to the classroom. There are lots of things on my mind. But mostly, I realize that in a few weeks my new students and I will embark on a new adventure. Hopefully, it will be a year full of discovery, inspiration and joy. To everyone returning to school, I hope that your next year is a great adventure! Today we had the wonderful pleasure of going on another birding expedition with Russ Schipper in our backyard! What fun! We saw lots and lots of birds and heard even more! It's amazing how many birds inhabit our forests, wetlands and grasslands at North Shore! In addition, Russ brought with him a flat of Asclepias tuberosa (a form of milkweed) from his lovely wife, Ilse. My students and I planted it around the edges of our new Butterfly Garden. With a bit of rain, sunshine and good luck we will have even more great looking milkweed growing this summer! Earlier this fall we planted lots of native plants thanks to a grant from The Wild Ones. The monarchs will have great nectar sources, along with a variety of milkweed options to lay their eggs. Two of our raised beds now have hearty stands of Asclepias syriaca (common milkweed). Hopefully, we are developing a grand smososbord for butterflies and other nectar feeders. Thank you Russ, Ilse and everyone who has been helping us with our new garden! 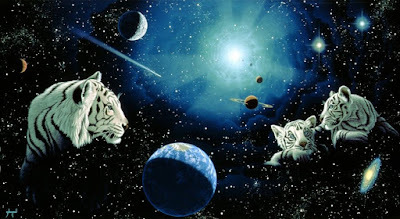 "Science but increases the mystery of the unknown and enlarges the boundaries of the spiritual vision. To feel that one is a useful and co-operating part in nature is to give one kinship, and to open the mind to the great resources and the high enthusiasms. Here arise the fundamental common relations. Here arise also the great emotions and conceptions of sublimity and grandeur, of majesty and awe, the uplift of vast desires,--when one contemplates the earth and the universe and desires to take them into the soul and to express oneself in their terms; and here also the responsible practices of life take root." 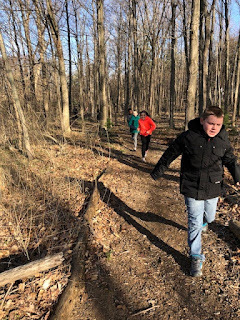 It's spring and we are back to running every morning on the trail! Our bulb garden is up! The spring peepers and the red-winged blackbirds are singing! The bird feeders are emptying at an incredible pace. There are signs of life everywhere! My class and I are turning our minds toward the season of spring and looking toward that amazing summer break that promises barefeet in the warm sand and lazy bike rides down the Kal-Haven trail. It makes it a bit hard to stay inside. 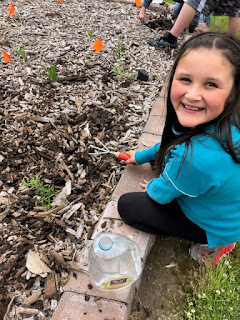 This past week, we celebrated Earth Day. We picked up garbage on our campus and wandered over to the middle school to clean up their campus as well. We learned how to make recycled paper (paper we will use for a special writing project in May). We picked daffodils in the "hidden garden" (a huge patch in the woods) and we studied our own bulb garden. I shared some of my favorite Earth inspired books (Dear Children of the Earth, The Other Way to Listen, Just a Dream, and Whisper from the Woods).
" . . . I need your help. And the animals need your help, too. "But Mother Earth," you ask, "how can I help you and all my sister and brother animals when you are so big, and I am so small?" Well, my children, let me tell you something, I am not so big. As a matter of fact, I am quite small. When you go outside at night and look up at all the millions and millions of stars, you will see how small I really am. Compared to the night sky, I am no bigger than you!" What a powerful image. 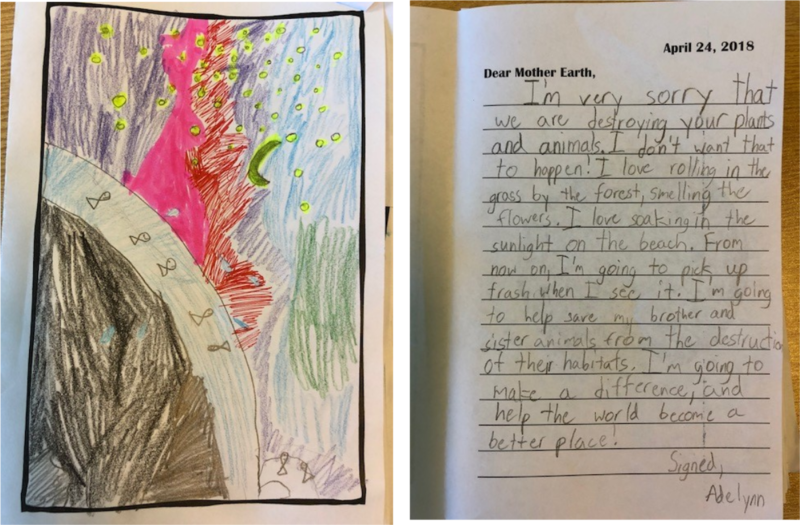 The story continues by asking the children what they think is the most important thing they can do to help her (at this point students have all kinds of ideas). The response is simple . . .
"I need you to love me. That's all. Just love me as much as I love you. Because when you love me, you will care for me. And when you care for me, you will protect me. And when you care for me and protect me, you will save your Home, and the homes of your sister and brother animals." 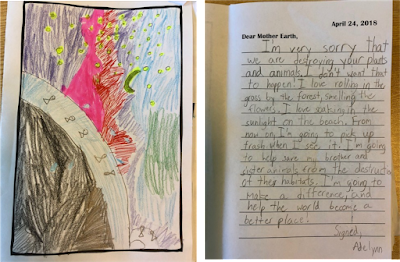 My students wrote letters back to Mother Earth after this inspiring and beautiful book. They did a wonderful job and the letters were filled with love. I was so pleased. "...when one contemplates the earth and the universe and desires to take them into the soul and to express oneself in their terms . . . the responsible practices of life take root." I am reminded that education is more than facts, it's an emotional relationship. Happy spring everyone!